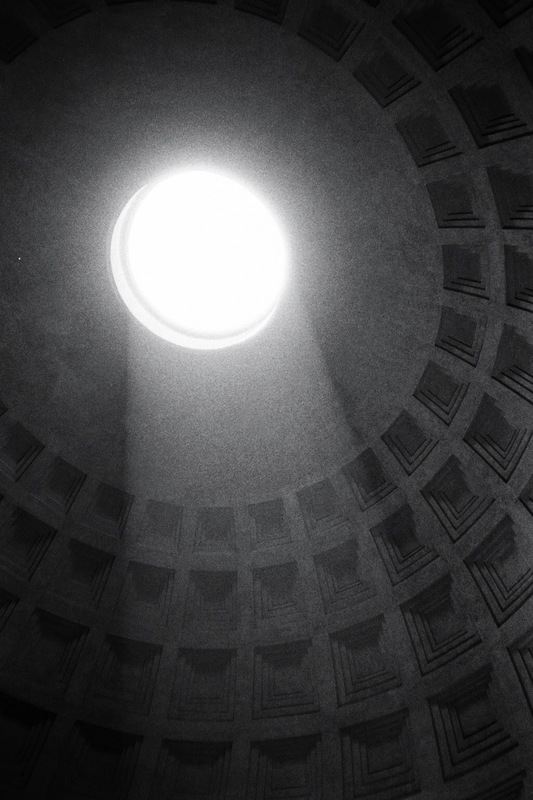 I knew the Pantheon was the one place in Rome I needed to see, because of The Moon. A photograph which hung in the hallway of the family home throughout my childhood. For many years I had believed this photograph to be depicting the moon, and was very impressed at my father's ability to capture the moon up so close, a looming, perfect sphere suspended in the inky matte darkness. I don't remember when I became aware that the photograph was not of the moon, but I had grown; grown tall enough to see the detail in the image: the visible rectangles of the coffered dome. Clearly this was no moon. How I managed to learn this was in fact a building, a large dome, and my moon was in fact a 9m diameter skylight, I don't recall. My dad was in Italy in 1981 - he was in the crowd when the Pope was shot. In June, I went to the Pantheon to attempt to recreate his original image from memory. I had last seen the photo over a year ago, and had not studied it closely for more than five. I am not even certain I got the angle right.